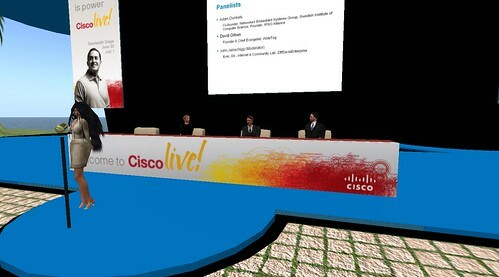 The last few days have seen a good few events in both virtual and physical space. It is a mini conference season. 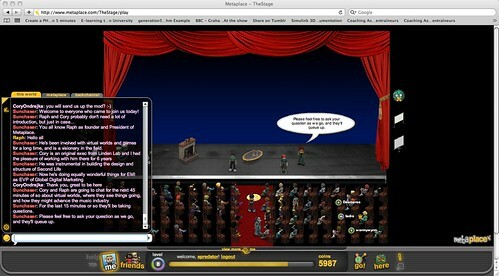 The first (that I had to drop out of half way through) was Raph Koster talking to Cory Ondrejka in Metaplace. This was notable for several reasons. The first was the number of Second Life friends in there. With a back channel conversation about how we were all happy to have both SL and Metaplace as places to gather for different reasons. The second was that Raph was kind enough to pick up on my question that relates to avatars and what they actually are. I asked “Can we have our avatars be the room?”. Cory spotted the similarity with the concept of being a Dungeon Master which is the though that got me on this track a while back. Also Metaplace has now become embedable in pages. So your event can be seen live by people sitting on your blog as Cory did. 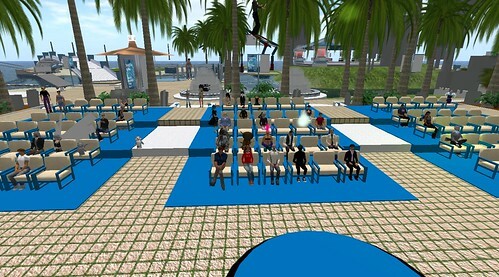 I managed to attend the other SL event though. This was about the sensor networks and the Stirling “internet of things”. In the post event I sort of changed from audience to presenter as I showed off my mini wearable presentations which turns me into a virtual peacock to show off some ideas. It was not a spamming or griefing excercise but just sprung out the conversation. Another post event discovery was when the audio stream switched to Kona Radio Gospeed Racer was at the event too. They played a fantastic mashup that I had not come across. (Sorry to the cool kids who alread know of this artist). It was called Boulevard of Broken songs by Party Ben. This was an incredible mash of Green Day and Oasis (Plus Travis and Eminem). I checked out some more of the songs and they are all fantastic, cleverly technically but also creatively. Well worth checking out. Finally in the events list there is the event that I did not get to in physical or virtual form, but that instead had some great coverage from my good friend Roo Reynolds. He always takes great notes and shares the salient points on his blog. In this case the Guardian Activate 09 gathering. As a gathering and conference with the tag line “Politics, economics, technology and society: Building a better future through the internet” the whole thing was well aligned with my interests as Feeding Edge, so I am thankful as I could not attend that I got a version in Roovision.